South Korea`s LG Display has raised 20 billion yuan ($2.91 billion) in syndicated loans with Chinese banks to finance its share of a 5 trillion won ($4.5 billion) OLED joint venture, LG Display High-Tech, in Guangzhou. The banks in the syndicated loan agreement are China Construction Bank, the Bank of Communication, the Agricultural Bank of China and the Bank of China, the panel maker said Thursday. A syndicated loan refers to a mid-to-long term loan offered by a group of lenders to a single borrower under the same conditions, making it easier for the borrower to access a large-scale loan. LG Display said it was able to use the fund for eight years under a competitive borrowing rate but fell short of providing financial details. The fund will be used for LG Display High-Tech where the production line is under construction and is set to start in the second half of 2019. 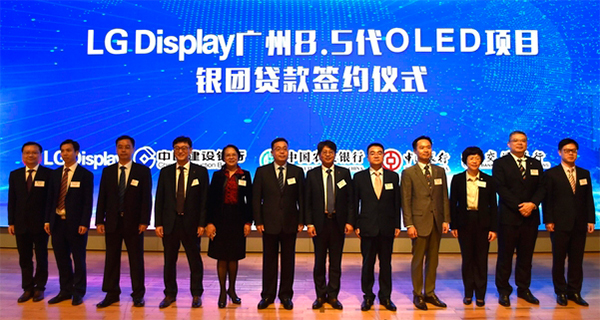 "The agreement shows that the future of the OLED industry in China, the world`s largest market, is bright. LG Display will raise the affiliate’s competitive edge fast in the large-sized OLED market," said LG Display Chief Financial Officer Kim Sang-don. According to market research firm IHS Markit, demand for OLED TV panels is estimated to surpass 10 million units after 2020. LG Display opened the joint venture in China in July to produce 8.5-generation OLED panels. LG holds 70 percent stake and the rest by the Guangzhou Development District. On Thursday, LG Display shares ended 3.43 percent lower at 16,900 won.